The Medina County Fair opens on Monday, Aug. 1st. Yesterday, Saturday, was the day that hundreds of young 4-H members and their advisers swarmed the fairgrounds on booth set-up day. In addition to the animals being brought to the fairgrounds to be housed all week for fair goers to see and 4-H members to show in highly competitive judging, 4-H clubs set up booths in the 4-H barn to showcase members projects that were worked on all year. The highlight of booth set-up day is the first opportunity to purchase a milkshake from the 4-H milkshake booth. Hand-dipped ice cream with many flavors to choose from is mixed with milk by 4-H volunteers who run the milkshake booth as a business. They organize early in the year, elect officers, delegate responsibilities and start recruiting volunteers to work the booth during the week-long fair. It is easily the busiest booth at the fair. For those of you who may not be aware of 4-H, the organization was founded in Ohio by A.B. Graham as a supplement to the public education system. The motto of 4-H is, “To Make the Best, Better” . Sounds like a lean principle to me. 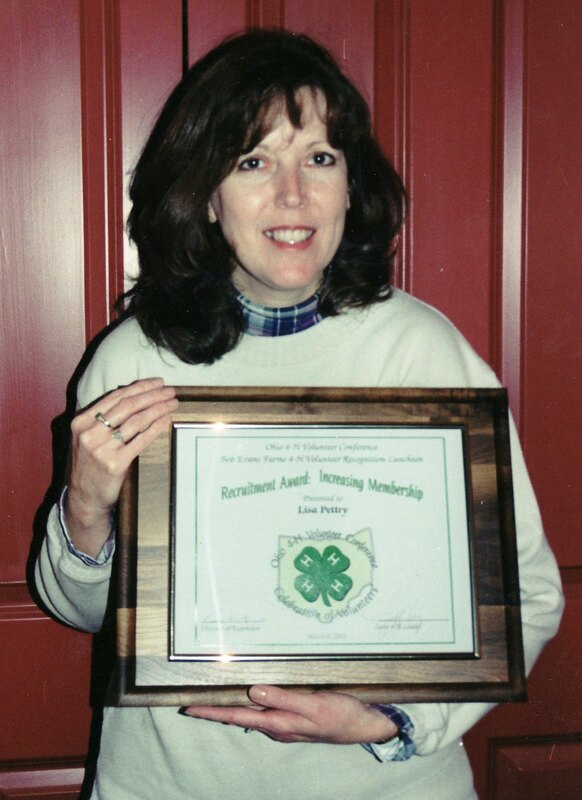 Over the years, as my children were growing up, my wife and I became 4-H advisors. My wife, Lisa, started a club for home-schoolers and she was recognized at the State level for recruitment. Our daughters, Sara and Nina both were recognized as Outstanding Court members – two years each! This was due to their hard work and efforts with their annual projects in sewing, cooking, small animals, cake decorating and others. My wife’s attention to helping teach my kids and other club members truly helped make the best, better. My favorite time of the year was booth set-up. I became the un-official champion of this annual project. Each year, the fair committee chooses an overall theme for the fair, then 4-H clubs design booths around that theme to display members projects. The club advisors work with the club members to choose a theme for the booth that reflects the overall theme for the fair. The kids then share ideas on how best to design the booth and the planning for booth set-up day begins in earnest. With a plan in mind, the kids work with adults to acquire the materials needed for the booth construction (Thanks to A-Kobak Container for donating the cardboard) and on Saturday morning, Mr. Pettry and several of the senior club members would gather to construct the frame of the booth. Once the frame was up, Mrs. Pettry and the other advisors would work with the kids to decorate the booth. Each booth would then be judged by a committee of 4-H officials looking for specific criteria and would award Outstanding Booth status to those booths who met the criteria for the booth presentation. 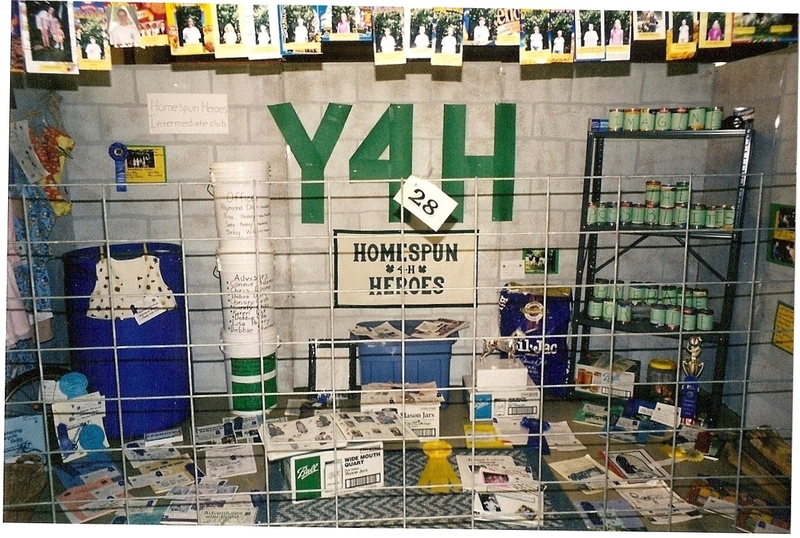 Here are a few of my favorite Homespun Heroes’ outstanding Booth award winners from the turn of the century. So the purpose of this post? Values obviously go beyond the workplace and greatly influence our lives. When the values of the organizations we belong to align with our personal values, great satisfaction occurs. 4-H is a terrific organization for our children to learn leadership lessons and other life skills. 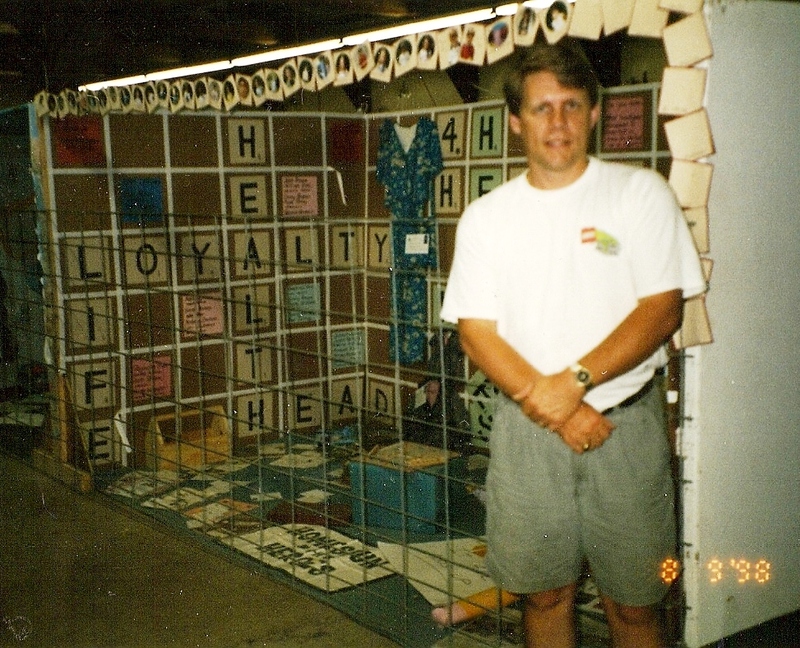 Perhaps the greatest display of aligned values occurred in 2001 in the wake of a tragic accident at the start of the fair, on booth set-up day. A steam engine explosion killed five people and injured at least 35 others. It was a devastating event for the families of the victims and sent a shock wave throughout the community. What happened later on during the week at the livestock auctions still brings a tear to my eye. The kids came up with a plan to donate half of their earnings from the auction of their livestock to a fund that was set up for the families of the victims. It was amazing to watch as each kid brought their animal into the auction area and announced that they would donate half of their earnings to the fund. The beautiful part of the story is that the community responded with record prices for the animals, thus ensuring that the kids were able to earn as much as they had in the past, however, the families of the victims also received over $20,000 from the 4-H kids. This is what aligned values looks and feels like. Our family has greatly benefitted from 4-H and the Medina County fair. Working on the projects throughout the year, culminating with the display of projects during fair week for all fair goers to admire. In a future post, I’ll write about the lessons in visual management that my father taught me when he was running his church’s food booth at the fair. If you haven’t already visited your local county fair, please do yourself a favor and go – not for the rides and gaming attractions – but for the joy of watching kids show their animals, display their projects, or make a milkshake. The linked article caught my eye recently and I thought I would share some thoughts on The Business of Communicating Values. The discussion of Values – the way that they flow through an organization and are aligned vertically, horizontally and even diagonally across the organization and drive behaviors is the purpose of this blog. I had a good day earlier this week. My morning started as a facilitator of the Cleveland Clinic Experience for a group of our incoming residents. Over 40,000 Clinic caregivers have been through this 3 hour program that aligns all caregivers around the Clinic’s Mission, Vision, Values and expected service behaviors. Two hundred attendees seated at tables of ten people, with a facilitator at each table to guide the discussion, discuss their roles in providing our patients with world-class care. It has been great having the opportunity to talk with fellow caregivers and hear their stories. Yesterday, I was struck by the diversity of the group I was facilitating. Young doctors from Las Vegas, Utah, Chicago, Boston, Cleveland, Russia, China, India shared their experiences. We talked about how we will all need to work as a team to provide each other with the best possible employee experience. This positive employee experience reinforces and supports our ability to provide our patients with the best possible patient experience as we continue to provide the best possible clinical outcomes. The discussion is centered around how we all need to adhere to our stated values of Integrity, Teamwork, Innovation, Service, Quality and Compassion. Where stated organizational values differ from individually practiced values, organizations suffer from waste. Wasted time, poor communication, bad decisions, waiting due to confusion, and on and on. Being able to identify where and why this misalignment occurs is where organizational development and lean systems and tools are used to align the organization towards its stated mission and goals. Clearly defined roles and responsibilities along with clear communication channels and standards provide employees the freedom and confidence to make decisions. It is the ultimate expression of the lean principle of “Respect for the Individual”. I’ve been fortunate to attend some of the best training on organizations that exists and have learned about organizational and individual behavior from the very knowledgable people I’ve worked with. The Cleveland Clinic Experience is an ambitious, well-designed cultural alignment tool and has served its purpose to communicate the Mission, Values and expected service behaviors to all caregivers and anchor them to our Guiding Principle of “Patients First”. We will be assessing the results over time to measure the effectiveness of this alignment exercise. So how are other organizations aligning and assessing their values? Organizations which are using the Shingo Prize model benefit from a well-thought out assessment model that focuses on assessing behaviors – in addition to business results – to determine the extent to which the organizatoin has transformed into a Principle-based organization. In addition to the assessment model, the Shingo Prize has crafted a great visual of what the organizational transformation should look like. The training offered to Shingo Prize examiners is by far the best I’ve attended. In it, the discussion about values goes deeper than any other discussion I’ve heard or read about. To briefly summarize a key point in the model – stated values are important for organizations and the individuals working in them, however, those values need to be anchored to the proper guiding principles. Stated values and alignment are not enough. It is the Guiding Principles that determine the direction the organization takes. The example used in the training lists the values of “teamwork”, “innovation”, “precision”, and “loyalty”. These values can be claimed and displayed by many organizations – including a gang of robbers who steal from others. Without guiding principles to anchor to, such as Respect for the Individual, values are just descriptive words. When anchored to guiding principles, values drive desired behaviors. The guiding principles of operational excellence as expressed in the Shingo Prize Model provide organizations with a framework to work within and the transformational model presented helps organizations understand how Guiding Principles need to be supported by Systems that are aligned with the Principles. These systems are then used to select the appropriate Tools to achieve the desired Results that affirm the organization’s stated Guiding Principles, which are apparent in the behavioral evidence observed in the culture of the organization. Brilliant! The HBR article reference at the top of this post is good, however, I would encourage you to take some time to read the Shingo Prize model and guidelines to get a glimpse of what Operational Excellence looks like. This is the stuff that we need to be teaching in our Business and Medical schools. At approximately the same time I was working on Gifford Brown’s presentation on lean discussed in my previous post, I was also responsible for developing our plant’s new peer-to-peer, non-monetary employee recognition program, which came to be called “Excellence in Action”. It’s focus was on recognizing and rewarding the behaviors that supported Cleveland Engine Plant 2’s Cleveland Production System. This program provided employees at all levels of the organization an opportunity to recognize fellow workers in the categories of Leadership, Involvement, Innovation & Ingenuity, Effort, Quality and Safety. I designed the logo shown here. It was a nice way of depicting the continuous improvement cycle. Leaders need to experience a level of excellence before they can start to expect it. Then, they need to exude the behaviors that they should expect their employees to exhibit. 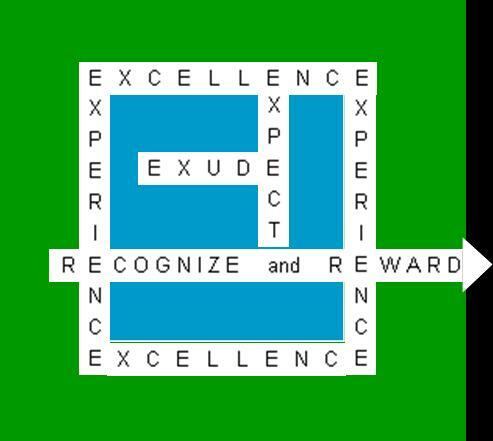 If leaders experience excellence, exude it and expect it, then they need to recognize and reward it when they see it to reinforce the appropriate behaviors. When this cycle is completed, a new level of excellence will have been achieved. Recently, I had an opportunity to share this concept as part of a leadership retreat at another organization and made a slight adjustment to indicate the link to continuous improvement and moving forward. The revised image is below. What’s valued in any organization gets measured, recognized and rewarded. 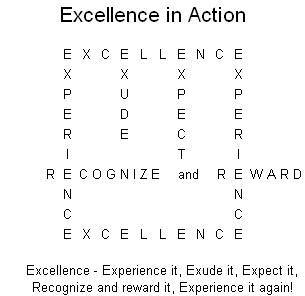 As you align your organization, start with an expectation of excellence. Define what excellence means to you and then model it, so that others can follow you. Design and align your systems to support your principles and values and make process improvement tools available to all employees and encourage them to experiment and learn. As you will see as I continue my posts, I like to model my thoughts and present them visually in order to demonstrate alignment. If the pieces can’t fit together to tell a story, chances are the concepts won’t work. I’ve been fortunate to have experienced excellence and it is a great feeling. I’m interested in hearing other stories on how you’ve set expectations and experienced excellence. It’s the mindset, then the measurement! Mark Graban @leanblog recently tweeted several articles about the Atlanta School district’s recent cheating scandal. Here is the latest reference article. The report details a “culture of fear, intimidation and retaliation” that pushed teachers to cross ethical lines and cover up their involvement when confronted. This situation clearly demonstrates that what is valued by an organization drives what gets measured. However, values when not anchored to guiding principles can create systems that drive good people to exhibit inappropriate, even illegal behaviors. Apparently, the educators in Atlanta and in other school districts have been driven by a “results at any cost” culture that led them to forget that their purpose is to educate the children, not just pass them. Misaligned measurement, recognition and compensation systems drive the wrong behaviors in employees. The Shingo Prize transformation model illustrates this relationship between Guiding Principles, Values, Systems, Tools and Results. Nearly 20 years ago, I was a new cost analyst at Ford’s Cleveland Engine Plant 2. I was completing my MBA and writing my research paper on the implementation of a team based approach to manufacturing at Ford using lean manufacturing. Our plant manager, Gifford Brown, told me that the biggest barriers to our success would be our labor and overhead reporting system and our recognition and compensation systems. Labor and Overhead budgets drove managers to produce at any cost and put the emphasis on building inventory and accepting poor quality – the biggest forms of wastes in a lean world. Our compensation systems were built to reward managers for meeting their budgets, so when they were asked to support a team-based system, they were wary of changing the behaviors that had resulted in annual raises in the past. We couldn’t expect behaviors to change, until we changed our systems. Our finance team benchmarked other Ford plants that had met their budgets over the past 5 years, including an annual task, and found that although they had met their budgets; their actual costs had continued to rise year over year. They were good at generating authorization, not so good at reducing costs. We formed a cross-functional team of managers from production, quality, finance, maintenance, and engineering to develop a new measurement system that took the emphasis off of labor and overhead budget results and placed the emphasis on input and process measures of Safety, Quality, Delivery, Cost, and Morale. We were still required to report our plant’s labor and overhead performance to Dearborn; however, we took the emphasis off of departmental budgets. Gifford invited Carl Thor, a well-known author and authority on measurements to come to our plant to review our work and offer his insights. During our discussion, our Controller seemed uncomfortable with the discussion. He knew labor and overhead budgets-he “controlled” them, he wasn’t as sure that tracking planned maintenance vs. crisis maintenance, or first-time through, or the most difficult to understand – Employee morale would lead to better financial results. I remember him asking, “but how will we measure it?” It was then that I first understood that “It’s the mindset, then the measurement.” If we could get people focused on the right things, we could find a way to measure it. One of my favorite questions to ask employees is “were you successful yesterday?”, then following up with “How do you know?” Creating the right vision of success must come before you attempt to measure it, however, once success is defined and understood by all, you must be able to measure it. CEP 2 developed our new measurement system. We successfully implemented a team-based structure, created a behavior-based recognition system and the plant earned the Shingo Prize. When teachers start cheating, the system is broke. There needs to be a re-alignment of our expectations of our public schools and teachers, how we measure success and a re-thinking of how teachers are recognized and rewarded for their work. It will not be easy, but it is required if a measure of our success as a country is the education of our children! Welcome to Values Stream Alignment. My name is Tim Pettry. I work at the Cleveland Clinic, implementing and facilitating continuous improvement activities within the Neurological Institute. For the past 20 years, I’ve been a student and teacher of Lean and have finally decided to take the plunge, and start sharing my thoughts on lean and organizational development. My blog’s name, Values Stream Alignment comes from an observation I had while working at Ford. Lean practitioners use value stream mapping to identify where products and information stop flowing, thus exposing waste. I recognized that where an organization’s VALUES stop flowing, there is greater waste. The waste of human potential. Thus the need for mapping the flow of Values in an organization to see where they are mis-aligned and implement organizational development mechanisms to align the thoughts and actions of everyone in the organization. This application of a basic lean principle of flow to the world of organizational development has been a focus of mine since 1997 that I have continued to develop and refine. I have been a Shingo Prize examiner since 1996 when I helped lead Ford‘s Cleveland Engine Plant 2’s successful challenge for the Shingo Prize. For the past 5 years, I’ve been involved with the SME / AME / Shingo Prize / ASQ Lean Certification program. First as a writer of exam questions, then as an appointed member of the Oversight and Appeals Committee, representing the Shingo Prize organization. In 2010, I served as the elected Chairman of this committee. In late 2009, I became involved with the Healthcare Value Network as a member of the Assessment development team, where we are using the Shingo Prize model to help healthcare organizations focus their continuous improvement activities. This alignment of my participation in outside organizations and their objectives serves as my model for Values Stream Alignment. My posts will draw on my struggles and successes with aligning people and organizations around the principles of lean as outlined in the Shingo Model. I’m looking forward to the exchange of ideas! Blog contents copyright © 2011 Values Stream Alignment. The views expressed here are solely my own personal views and not those of my past or present employers.